"in Xōcotl (fresh and natural), we transform fruits and vegetables into foods and drinks that fill us with life and health ..."
Xōcotl: palabra náhuatl que significa "fruta". En la cosmovisión azteca, el décimo mes del calendario se llama Xōcotl-Huetzin (la caída de la fruta). Era un momento para cosechar y celebrar los "días muertos". El "Xōcotl", una fruta roja, se colocaba sobre un palo pulido, que simbolizaba el árbol de la fertilidad. Los jóvenes bailaban y trepaban al poste para tumbar el Xōcotl. Vanessa y Omar, los dueños de Xōcotl, esperan llevar el simbolismo de las raíces prehispánicas a PDX. Xōcotl transforma frutas y verduras en bebidas y alimentos nutritivos que nos llenan de vida y salud. Vanessa y Omar crecieron en la Ciudad de México y emigraron a Oregón en 2002. Su espíritu emprendedor y su experiencia empresarial pasada finalmente los llevaron a los Programas de Emprendimiento de Portland Mercado. En marzo de 2018, lanzaron "Xōcotl - Fresco & Natural", su primer negocio en los Estados Unidos..
Xōcotl: Náhuatl word meaning "fruit". In the Aztec worldview, the tenth month of the calendar is called Xōcotl-Huetzin (the fall of the fruit). It was a time to harvest and celebrate the "the dead days”. The "Xōcotl", a red fruit, was placed on top of a polished pole, symbolizing the tree of fertility. Young men would dance around and climb the pole to knock down the Xōcotl. Vanessa and Omar, Xōcotl’s owners, hope to bring the symbolism of our pre-Hispanic roots to PDX. Xocotl transforms fruits and vegetables into beverages and nutritious foods that fill us with life and health. Vanessa and Omar grew up in Mexico City and emigrated to Oregon in 2002. Their entrepreneurial spirit and past business experience eventually drew them to the Portland Mercado’s Entrepreneurship Programs. 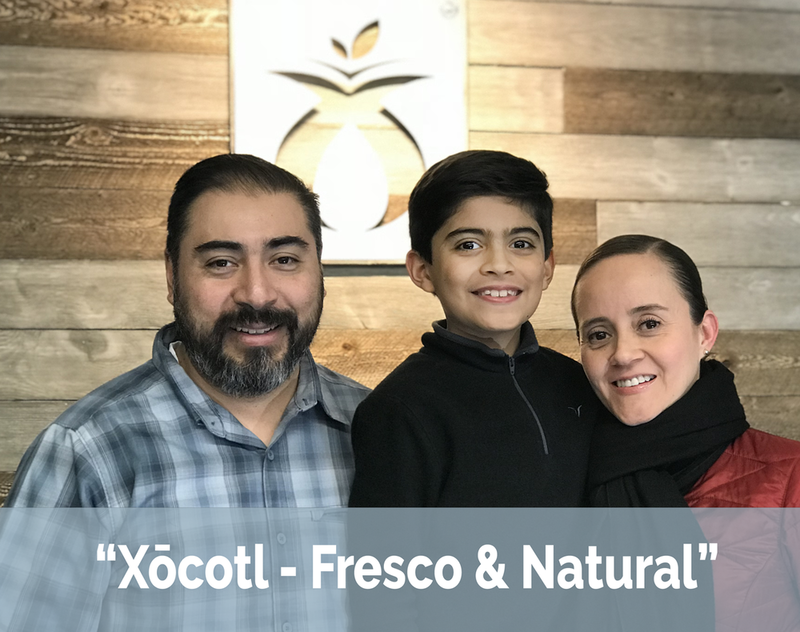 On March 2018, they launched “Xōcotl - Fresco & Natural”, their first business in the United States.